Jewish Humor Central: Look Out, Riverdance Fiddlers. You've Got Irish Chassidic Competition! Look Out, Riverdance Fiddlers. You've Got Irish Chassidic Competition! 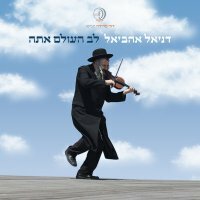 Daniel Ahaviel is a British klezmer violinist who made aliyah to Israel in 1988. His violin playing covers an amazing range of musical styles, including chassidic, klezmer, and Irish. Born in London, with a Bachelor's Degree with honors from the University of York, Ahaviel has been playing the violin for 36 years, and also plays piano and percussion. He has appeared in concerts and music festivals around the world. Ahaviel has released four albums, combining violin, vocals, and stories. He speaks English, French, Hebrew, German, and Italian. We came across this video on YouTube that had us transfixed. We just had to share Ahaviel's fiddling and dancing. The last time we heard and saw such fiddling talent was watching Mairead Nesbitt performing in Lord of the Dance and Celtic Woman. We invite you to experience Ahaviel's Irish medley, followed by Nesbitt's performance with Celtic Woman at Slane Castle in Ireland . Enjoy!